Beautiful views of the sunset in this 3BR/2BA west end condo overlooking inlet. 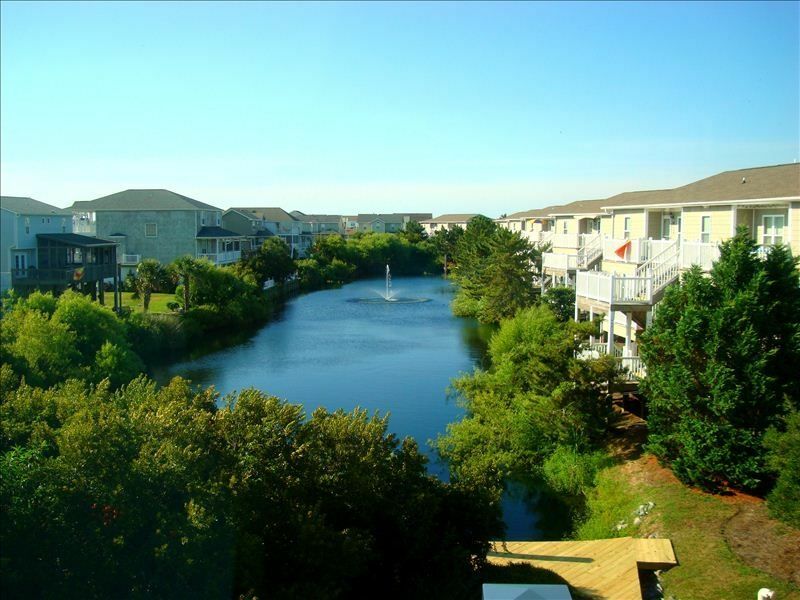 Welcome to Ocean Isle Beach and our newly renovated Starboard by the Sea Condo. Ocean Isle is one of the southern most beautiful and unique barrier islands of North Carolina. It is situated a short distance south of Wilmington, N.C., and a short distance from Myrtle Beach, S.C. There is so much to see and do around Ocean Isle, that you will not want to leave. Ocean Isle is approximately 25 miles to all the shops at Barefoot Landing in N. Myrtle Beach and approximately 40 miles to one of two Tanger Outlets in Myrtle Beach. Plenty of shopping, and some of the best seafood you will ever have is 15 minutes up the road in Calabash, NC. On the inlet to the IntraCoastal Waterway with beautiful views. This was a very homey feeling place with a great fountain view from the balcony and great views of the evening sunset from the porch. The only difficulty we encountered was the chairs at the kitchen table. When 2 people sat side by side, the width of the chairs made it difficult for someone to get their legs in and out. The rug underneath also made it difficult to slide the chairs once you were sitting down in them. House was clean, well stocked, and close to the beach!! We had a blast thank you!! Very nice for our purposes. Bathrooms are small but adequate. Kitchen is small but we ate out most of the time. 1st timers to OIB for a family wedding, the accommodations were perfect and very comfortable. Loved the view on either side of the condo and close to pretty much everything we needed. Would definitely stay here again. Beautiful views of the intracoastal waterway and a short walk to the beach. Our family loved our stay! Michelle, Thank you for your response. I wish I could disagree with you, but sadly you are correct about the bathrooms being outdated and we have had an issue with one of the showers dripping, which causes the bottom of the shower curtain to mildew. The owner has been doing upgrades on the unit over the last 2 years, (den furniture, king size bed, queen beds, new flooring) as funding allows. The next project will be the bathrooms and the kitchen. I'm sorry for the experience with the washer/dryer; these units have since been replaced. I hope you will give us another try as we would love to have you stay with us again. Add 12.75% tax; and $100 cleaning fee. No Smoking and No pets allowed. Contact for holiday rates. Paypal is the preferred method of payment. Monthly rental available for off season months. Contact us for rental rates.